The Communograph House, an exhibition of research-based artworks by artists Regina Agu, Lisa Harris, journey, Michael Khalil Taylor, Rebecca Novak, and Ifeanyi Okoro; the exhibition was curated collaboratively among the artists, Kenyatta A.C. Hinkle and Ashley Hunt. “Communograph” is a multi-platform art project, conceived and initiated by Ashley Hunt and organized in collaboration with artists and residents of Houston’s Third Ward community, Project Row Houses, the Cynthia Woods Mitchell Center for the Arts, and students and faculty of the University of Houston’s School of Art. 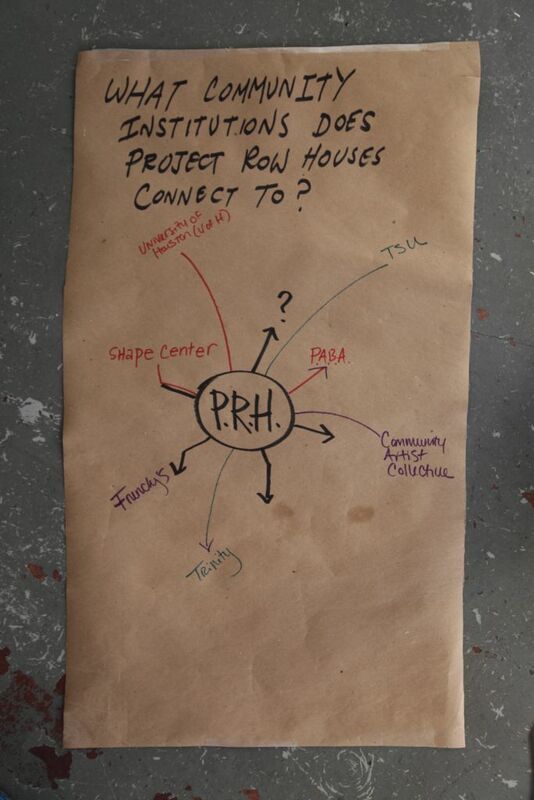 Hunt was originally invited to make a map of the Third Ward neighborhood that surrounds Project Row Houses, and through initial conversations with community members and questions about what it means to make a map today, the project expanded into a framework for community-based research, featuring five parallel activities: an exhibition, two public conversation series, a walking tour and architecture tour, and the building of a temporary “welcome center” for Project Row Houses. The title, “Communograph,” was developed to combine “community” with “writing,” as “photograph” combined “light” (photo-) with “writing” (-graph), so as to ground this research in a writing of community from the perspective of the community itself. In this way, each of the five research activities serves as a platform for community members to enter into conversation, sharing their thinking, their knowledge, their authorship and their interpretations. The goal is to build local questions, knowledge, audience and critique, while then returning to the original Third Ward map, available here. The larger form of “Communograph” was conceived as one that could be repeated in multiple sites and communities, and a book on the project is forthcoming. Communograph included 5 different platforms: art exhibition in the “Communograph House”; Sidewalk Talks, organized by participating artists and a local speaker of their choice; a Public Program series of artist talks and neighborhood tours; and community mapping projects resulting in a “welcome center,” designed by students of the Graphic Design Program at the University of Houston.